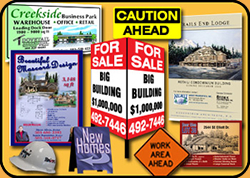 Contractors, developers, architects and realtors use Hollywood Signs and Graphics to represent their projects with high impact construction and site signs. These can be done at any size on many types of materials while incorporating any kind of graphics needed for maximum results. Contact us today for assistance on your next project. Copyright © 2008-2019 Hollywood Signs & Graphics and VisionSite Corporation. All rights reserved.